The focus of this tutorial is to learn how Apache Sling Resource Resolution is done in AEM. AEM uses Sling to develop web applications over Java content repository. Apache Sling is a Web framework for development of content-oriented applications. How Sling Resolution is done in AEM. Sling Resource Preference in AEM. How a url is mapped to corresponding jcr node in aem. How Sling resource resolution is done. The complete Sling Resource Resolution is shown in below diagram. Step-1: Double click on a page in siteadmin , to open respective page in browser. Step-2-3-4-5: Analyse the URL /contents/aemTutorials/sightlyPage it is known as content path. The /contents path refers to the path of content folder in crx de. 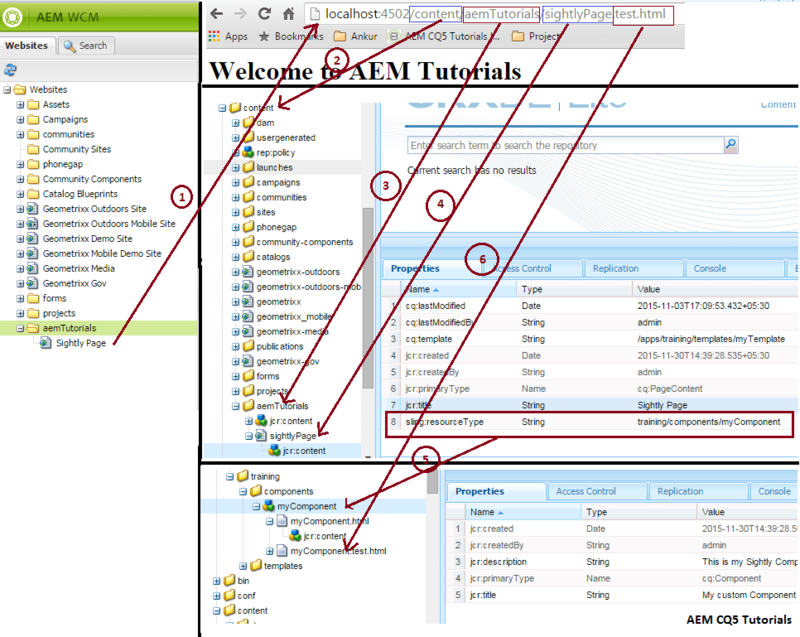 /aemTutorials refers to the package under contents folder. /sightlyPage refers to our page that we have created under siteadmin. jcr:content of sightlyPage contains a property sling:ResourceType. Which tells sling where our component is located. As shown in above figure it is at training/components/myComponent , means sling needs to check for myComponent under /apps folder. Sling appends the selector and extension after the component name i.e myComponent.test.html . If it found this component then it render it else it drops the extension and search again. If the component contains .html and .jsp files , then the first preference goes to html or jsp? Further enhancing above example, lets add few more files to myComponent component under apps. Lets create one more file with name myComponent.html. Note:- Sling decides rendering of script on the basis of selector + extension . First priority goes to selector, if no selector is available then priority goes to extension. Now if we double click our page http://localhost:4502/cf#/content/sample/testing.html then by default myComponent.jsp script will be called because here .html is an extension not selector . Means while resolving the script we see for extension in URL(HTML), in crxde we compare it with node name(myComponent) We can ignore the last part .jsp from node name. Its only relevance is .jsp gets priority over .html(sightly) file. Between jsp and html first priority goes to jsp as by default a component is linked to jsp at the time of creation. Now we add one more file html.jsp , now if we double click the page then html.jsp will be rendered as here it receives html as selector. Note:-If no match is found then it will look for sling:resourceSuperType if available on the component, then it goes to parent component and again run above 5 rules for script resolution. Hope You got a clear idea of How Sling Resolution is done in AEM. If you have any further doubt, Please leave a comment. 16 Responses to "How Sling Resource Resolution is done in AEM"
if the component contains .html and .jsp files. then the first preference goes to html or jsp? I have update my post with answer to your query. hope it helps in better understanding of sling resource resolution. In order to run this URLs, do we have to install a package? It being a tutorial, I was expecting to see step by step procedure for building this. Please confirm which is the correct one. When i again try creating files, Scripts are rendered as per above sequence. Please correct me if I have missed anything. Could you please share one demo application or example for this tutorial. I am new in AEM. Can you please help me to understand sling resource resolution. I had contentPage Component for ContentPage Template in my project. I used this template for creating a webpage. Please provide some idea how is it happening?